Well, a few things have intervened with the Princess Cecile scratchbuild. 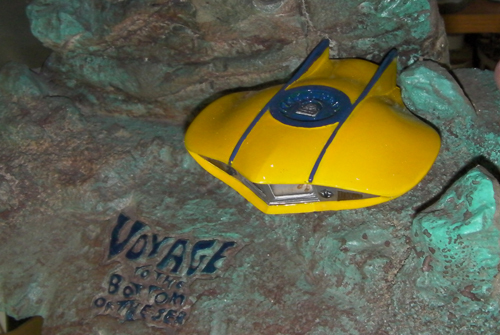 First, I finished the Flying Sub, One-man Sub and Diving Bell from the big Seaview project. (More on that in the next post.) Second, I finished a novel. Third, there was real life, and Christmas, and other stuff. When I got back to it I had sort of an idea for the plasma engines. Drake describes them as having petals that open and close, varying thrust; this makes the ship easier to land and semi-maneuverable close to the ground. I envisioned them like the “turkey feathers” of modern jet engine nozzles. So…that’s what I started with – an F-18 1:72 scale jet plane model part. I added some detailing with small bits of solder. 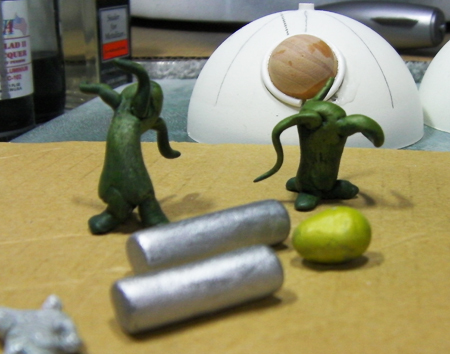 I used a rocket bell from a set of Japanese scratchbuilding parts I got from Starship Modeler to give it an interior. The whole thing is maybe a half-inch wide and three-quarters of an inch long. My first mold attempts were thwarted by old materials. I bought a Micro-Mark casting starter set in 2005. The materials, which really have a shelf life of about six months, were no longer usable. I ordered some more from Micro-Mark. The new stuff worked fine but it took me two tries to make a mold I was happy with. 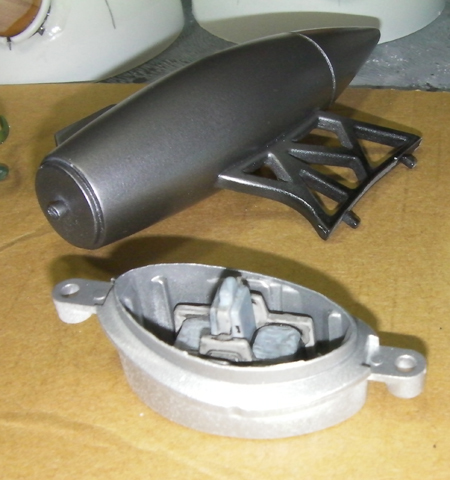 I added a little plastic vacuformed bulkhead from a set of parts I bought years ago from Apogee Rocketry, cut down, to the master as a pour-stub handle. After that everything was fine. The image here isn’t very clear, but the parts came out well-defined. 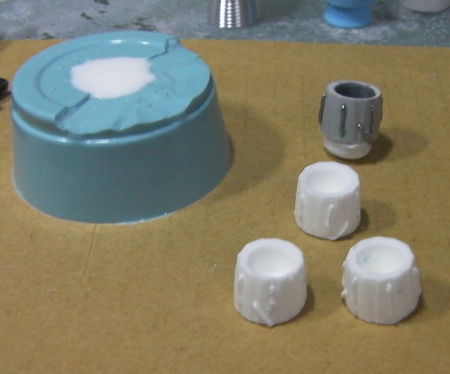 I only mix tiny amounts, less than 1/2 ounce, of resin at a time because I can only cast one part at a time. There is some waste. I need eight, and I will probably cast ten. Next is to settle on a design for the High Drive motors. I have a few ideas about those, but none I’m completely happy with yet. There’s a good piece on The Unofficial Apple Weblog about why Flash video shouldn’t be on the iPad and iPhone. I knew that Flash was somewhat crash-prone but I didn’t realize the problem was big enough that, in Snow Leopard, Apple engineers containerized the Flash process so when it crashed, Safari wouldn’t. I assumed Flash was not implemented on the iPhone either because Apple was still trying to optimize it or they were having problems with Adobe. Apparently it’s more one of those decisions Apple made to make the iPhone easy to use and reduce user frustration. By and large they got that right, so I can see why that could have been behind the decision. I don’t know much about html5 but I think we’re ready for industry-standard tools to extend the html version we’re all operating under. As web browsers become more and more an operating system, I’d prefer that system not be designed by Microsoft – or gimmicked so it only works properly in Internet Explorer, as Microsoft so often does. Obama scores one for the private sector! Okay, you’re right, it does indicate that he has absolutely no sense of American exceptionalism and he doesn’t get that this is part of his job as leader – to articulate a vision for our country. It’s inspiring and helps us all achieve more. He’s about as inspiring as Jimmy Carter, Walter Mondale and Michael Dukkakis rolled into one big-eared package. NASA has been engaged more in job protection over the last twenty years than anything else. It’s just another big Federal jobs program. Now, I happened to like the kind of thing they were doing, mostly, but they were doing it inefficiently and without any long-term direction. By killing the program now, Elon Musk at SpaceX and other private concerns – even Boeing or Northrop-Grumman – get a better shot. Not only do they have commercial launch service markets to serve, but anything the government decides it needs has to be bought on the commercial market, too. The actual shuttle service program has been privately run for years. Switching things completely over wouldn’t be that hard. Maybe this will drive some investment into the struggling space launcher companies. It’s a high-risk business right now, and big investors generally have stayed away, unless it’s an individual like Paul Allen, Richard Branson, Elon Music or Jeff Bezos. Imagine what would happen if one of these other outfits could get a could of big VC firms to look at them. With the US government out of the way, undercutting them for launch services, maybe somebody could actually make a profit! Remember, while a lot of the R&D in space flight was done by NASA, the hardware was, and is, generally built by somebody private. (Do you know who was the prime contractor for, and builder of, the first stage of the Saturn V? Chrysler!) Boeing owns more documentation, plans, design studies, research data and tooling than anyone else, especially after all the mergers. If Boeing could get some VC funding it would have a dozen well-planned and researched alternatives to choose from in its own archives. For years no companies could really break into the market because NASA would undercut their prices. Subsidizing the shuttle that way was stupid and, in the long run, bad for America. Now it’s possible, maybe, to get a couple of companies really rolling. – Sell KSC to Disney or Sony. Or to the State of Florida. Somebody that will do a better job of capitalizing on the history of the place. A space -exploration theme park would do more for igniting love of space for young people than the dry and dull history version that the KSC tour hands out. Right now it’s “yeah, we were damn cool once, but not any more…”. We need something that show us our great history but shows what could be done – more like Mission:Space at Epcot, but more hard-science. – Bid out the work of supplying the services NASA needs – crew changeout and resupply to the ISS, deep space probe and satellite launch services. Most of this is already done this way, but with more competition, shouldn’t we get a better price? Your tax dollars are being used here, you know! You can bid out cleaning services for office buildings – why not bid out the space launches? Then somebody like Bigelow Aerospace can take us back to the moon – for a good reason – PROFIT. Hey, Barry – you actually did something right! Who cares if it’s accidental? The folks at engadget got this shot at the iPad rollout yesterday…apparently no Flash capability in the web browser, like the iPhone. I know there is a lot of discussion about how Flash, when poorly implemented, is a speed killer. I don’t know which Apple is thinking – that html5 video will render the point moot, that they don’t want you to watch videos at hulu, but instead buy them from iTunes, or that they can’t optimize it so performance will be reasonable. Any could be correct. Apple has dumped technologies it considers out of date, like floppy drives. The company is not afraid to put out a product knowing that software could be evolving that will increase its capabilities. And they are not afraid of protecting their own bottom line. Shoot, guys, I even use Flash for slideshows and the like. I don’t overdo it but for some things it’s a good choice right now. Would it really kill you to include it? Really? For a device where the browsing experience is supposed to be important, this is a tough one to figure out. Add for those of you who say it’s not a phone…Fring. Skype. Vonage, even. Avatar is # 1! Er…# 26! According to BoxOfficeMojo, last Monday Avatar passed James Cameron’s little sinking-boat chick-flick for biggest take evah, at over $ 1.8 billion. That makes it # 1 in # of dollars of tickets sold. But adjust for inflation, and it’s only # 26, just ahead of…Thunderball. Yep, Bond, James Bond. The Bond movie so good they made it twice (same basic plot in Never Say Never Again. Interesting story, that.). What’s really #1? Gone With The Wind, of course. But, you say, the #1 number was worldwide, and the # 26 is domestic. Not fair!, you say. OK, then Titanic wins the domestic number, so far…but that could change. Back in 1939, the “Golden Year of Movies,” GWTH did three times the amount of money – ticket sales – of Avatar. Worldwide numbers aren’t on that page, probably because in 1939 there were relatively few theaters in a lot of the countries where today we find many. There was also that little adventure Germany was engaging itself in at the time. Might have cut down on the attraction for an American Civil War movie in , say, Poland. Know what else came out in 1939? The Wizard of Oz. Stagecoach, by John Ford. He also did Young Mr. Lincoln that year. Frank Capra turned out Mr. Smith Goes to Washington. 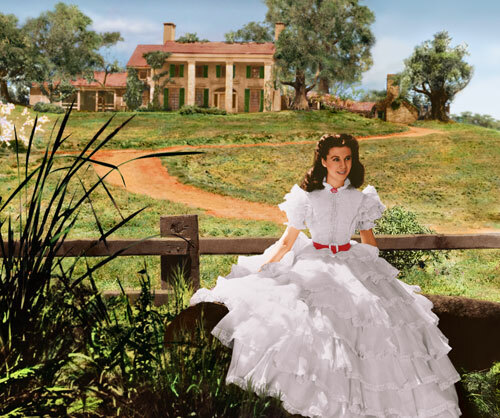 Then there were Wuthering Heights, Destry Rides Again, Gunga Din, Goodbye, Mr. Chips, Of Mice and Men, The Hunchback of Notre Dame. And a bunch of others. Pretty tough competition, eh? The Apple iPad. Yes, iPad. You gotta problem wit dat? In the past 12 months Americans (and those in other countries as well, I expect) had unreasonable expectations three times. First, it was James Cameron’s Avatar. It was gorgeous, a superb blend of CGI and live-action that seemed to be well worth the $ 600 M+ it cost to make it. The story was a little light, though. Still, at last count it was the #2 moneymaking film of all time, only behind Cameron’s Titanic, and it broke records for the sixth week in a row. Also, people outside the US liked it. 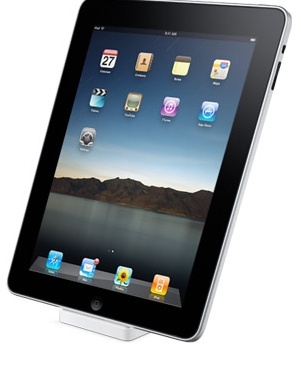 Second, today the Apple iPad was released. It’s more iPod Touch writ large than netbook, but Apple usually knows what it’s doing. (OK, Newton, a few others, but still…) It really does define a new market the way the iPhone did, and the way a real, human-friendly desktop computer did. Everybody wanted it cheaper, more powerful, doing everything a MacBook Pro can do – but it ain’t supposed to be a MacBook Pro. Remember the old Apple term – Steve may have coined it – “digital appliance.” Yep. This is it. It will be shipping worldwide all at the same time. People in other countries will like it, too. The third one, of course, is ol’ Barry, Barak H. Obama. You can’t have everything. He’s pretty much created disaster everywhere he touches (and he touches a lot). Tonight he’s going to gut the space program, as well. Thanks for that, by the way. Sure, lots of people had unreasonable expectations, but he’s not even living up to reasonable ones. He will probably outdo Jimmy Carter in screwing up the country and only taking four years to do it. The only good thing is that he could be a huge help to Republicans, if they don’t squander the advantage. Oh, and people in other countries used to like him. Now they make fun of him. You are currently browsing the The Old Gray Cat blog archives for January, 2010.